It was once said by a very wise technician that a great relationship between a dentist and his lab was like an “emotional bank account,” and it was measured in heart tissue and stomach lining. Socrates or Plato couldn’t have said it better! Even though a deep concept, it’s one that rings very true. 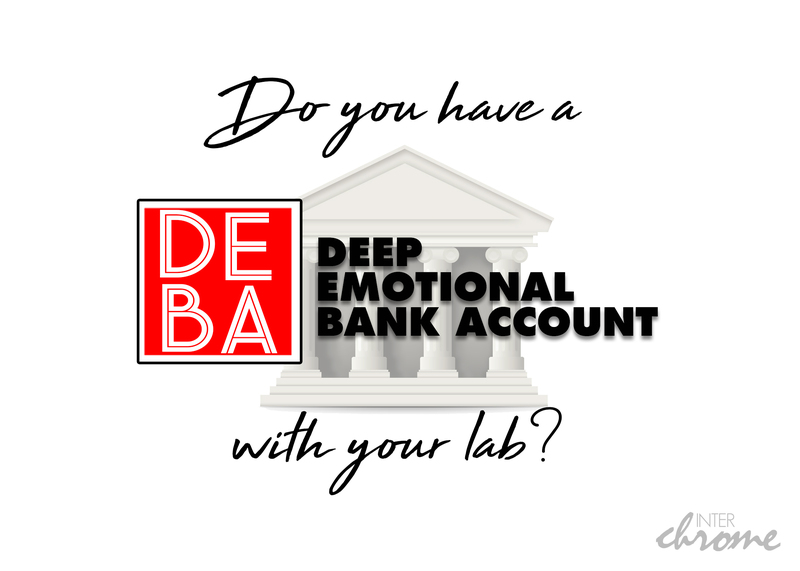 Do you have an emotional bank account with your lab? At Interchrome we want to deepen our emotional bank accounts daily with our clients. We want all of our clinician-lab relationships to be deep ones. Relationships where we’ve been down tough roads together, worked out complex scenarios, and really won the day for our patients. Together! Not all cases are straight by the book, and the most complex restorative options cost us all the most heartache. But clinicians that have experienced our lab will agree that we are more than happy to walk that walk with you. We know all too well, that while the dentist-lab relationship is a challenging one, it is symbiotic and necessary. Patients depend on our ability to communicate with one another, and ultimately improve their dental health. In other words, it’s not about us. Interchrome recently sent four technicians to Chicago to the midwinter lab conference. We picked up a lot about what’s new on the market, went to a two day Pekkton Summit,and had the chance to see what might be in our industry’s future. But the best part of the trip was deepening an emotional bank account with a client we’ve done business with for over ten years. After that long, we were finally able to sit down, share a meal, and really meet the people behind the work. That emotional bank account is very full. We care about the people we are working with, and they care about us. We know about their families. We know about their journey. We are a team. We can create together, because both parties trust the other’s expertise. This isn’t something that comes cheap, and often time and effort is the currency it takes to build this kind of relationship. Learn about turnaround times, and how pre-scheduling cases can help eliminate the difficulty of knowing when cases will be coming back to you. There are so many aspects to this, one could write a book, but let’s start here. Understand that shipping isn’t part of a turnaround time. In other words, when something may take 5 days in the lab to complete, don’t confuse that with you having the case back 5 days from today. 5 days may be the time it takes us to get to the case and then complete it because of other cases in line prior. Understand that when cases arrive without information, be it missing impressions, study models, shades, photos, whatever it may be, often times the workflow can’t even begin, let alone come to completion, so therefore make sure your lab script is fully complete. Maybe even call your technician before sending the case to see if anything is needed that you haven’t thought of. Know that pre-scheduling works as long as cases are able to be worked through without multiple shade changes, midline shifts, and resets. Perhaps a pre-scheduled case arrives for a denture finish, but it requires significant alterations to the setup that must again be tried in and approved, know that it will be impossible to still turn around a case for finish on a promised date. When scheduling tight turnarounds or steps that require a 24 hour turnaround, we recommend scheduling patients at the end of the day, not at the beginning. This way drivers or delivery services have the time to get the case in your hands. If weather or traffic becomes a problem, all of a sudden the patient could end up waiting for a case to arrive. The dreaded “Rush” case. Do they happen? Of course. Do we want to help you get through these cases that arise? Absolutely, but some things shouldn’t be rushed, or just plain can’t be. If it involves an outsourced step, or if we rely on an outsourcing solution to create custom parts, or technicians are already beyond absolute capacity, then we need to talk about pre-scheduling as a next best alternative. Sometimes instructions to the lab are very complex. When that’s the case, it’s often easier to write on a lab script, “Call Doctor”. We follow up on these kinds of instructions very quickly. When the lab calls to conversate about these kinds of cases, help us to connect with the doctor at the very first opportunity so that work can begin on the case. If it takes days or weeks to get this kind of information, then inevitably the case isn’t going to flow through the system as it otherwise could, resulting in turnaround times and pre-scheduled due dates being a moot point. Our lab is special in that we pride ourselves on offering the highest, and deepest level of service available. We all too often hear about the difficulty in communication between clinicians and their labs. At Interchrome, we seldom encounter these difficulties, due to the unique relationships we’ve forged over the years. Nowhere, will one find a team as ready and willing to forge through the tough stuff with our clients like at Interchrome, and it all starts with understanding and relationship. Give us a call at the lab, 757-271-5811, and we’d value the chance to talk about your cases, but even more, we’d like to invest in a new emotional bank account with you! Tagged Communication, Relationships, Scheduling, Turnaround Times, Workflows.